i love the fawn pillow! it's so cute! Love the colors here! And I wouldn't mind having that bracelet on my wrist! Marshmallow candle? Yes. I need that for my dietetics office! That clutch is so chic! And marshmellow candle... yes please!! 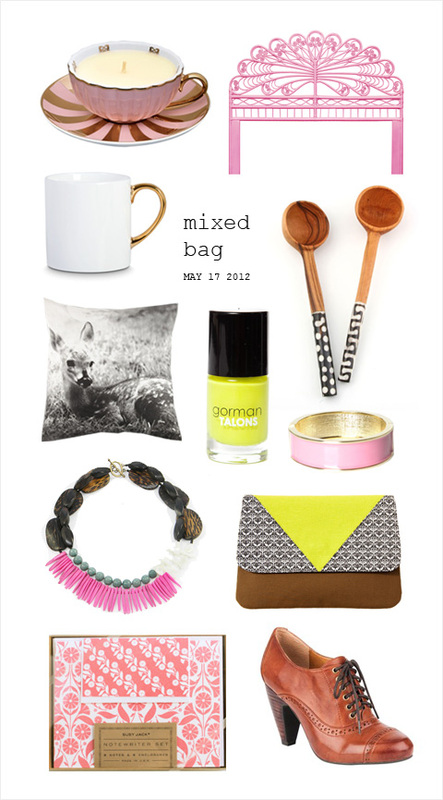 I love the bedhead, coffee scoops, bracelet and stationery. But they are all really good finds. That is seriously the coolest headboard I have ever seen. There's no way my fiance would ever agree to it, but I wish I could have had it in my room growing up! Maybe if we have kids? OH my gosh I have been looking for cane headboards like the ones that cane company sell for such a long time now, thank you! Of course I can't actually afford one but now I can stop looking and start saving!